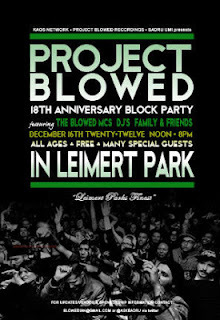 Project Blowed sponsored by KAOS Network held its 18th Annual Block Party in Leimert Park, Los Angeles, California on Sunday, December 16, 2012. 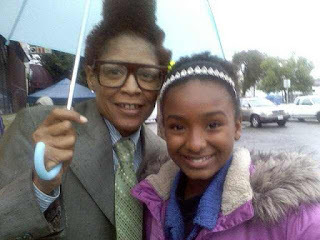 Known for its deep underground roots to Hip Hop Culture in Los Angeles, Project Blowed over the years has been home to such living legends such as Rifleman and Medusa (pictured below with young rap sensation Lil' Nay Nay). Hundreds of people from near and far (London, UK) came out on a cold, cloudy and wet day. Even on a bad weather day, the show went forward as local rappers graced the outdoor stage. Numerous vendors selling T-shirts, art, incense and other items lined the sidewalk. One tent was giving away childrens' toys and clothing items to those in need. Medusa, a local underground living Hip Hop legend also performed in addition to East Coast living Hip Hop legend Percee P, and also Lil' Nay Nay who has appeared in television commercials and several music videos including one with singer Cee Lo Green. Lil' Nay Nay also volunteered to host for Ed Magik TV at the event. She interviewed Medusa, Percee P, Rifleman, and others. 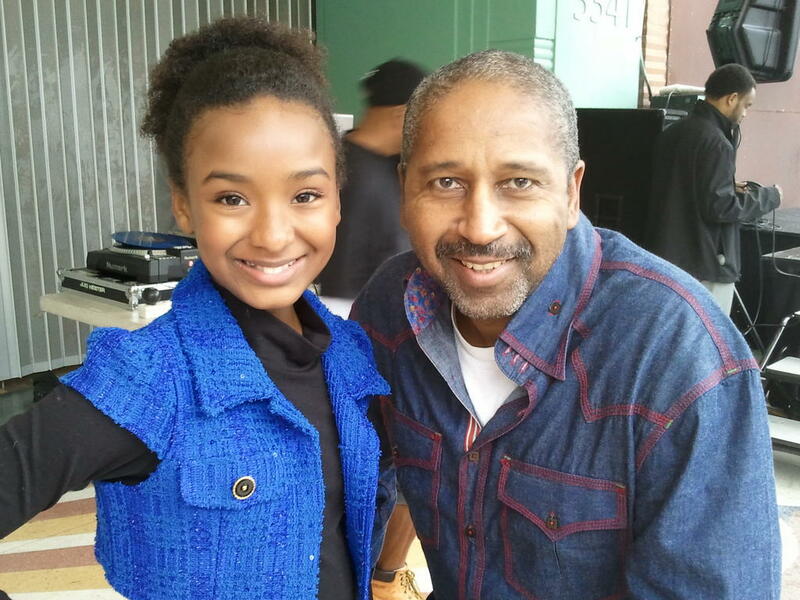 Pictureed Below is a photo of Lil' Nay Nay with Executive Producer of Ed Magik TV, Ed Magik. Video interviews will be published as an embedded playlist on this blog article in the space below. An actual video of a performance from the event will appear on Elements of the Culture channel on YouTube.com. LOS ANGELES (Dec. 12, 2012) — Nominees for the 19th Annual Screen Actors Guild Awards® for outstanding performances in 2012 in five film and eight primetime television categories as well as the SAG Awards honors for outstanding action performances by film and television stunt ensembles were announced this morning in Los Angeles at the Pacific Design Center’s SilverScreen Theater in West Hollywood. The Screen Actors Guild Post-Awards Gala benefiting the Screen Actors Guild Foundation will be hosted for the 17th consecutive year by People Magazine and the Entertainment Industry Foundation (EIF). The complete list of nominations for the 19th Annual Screen Actors Guild Awards® follows. A replay of both announcements will be available for viewing on tntdrama.com and tbs.com.